This topic provides selected notes and discussion on statements and clauses that are built into the Manifold query engine. The list in this topic is comprehensive but new items are often added with updates to Manifold and may appear in the product before they appear in this documentation. See the list in the query builder tab of the Command Window for an authoritative list of statements, operators, commands and functions. See the SQL Constants and Literals topic for some useful constants. A / slash character indicates "or" - a choice of one of the options is required. For example 'auto'/'none'/'aggressive' indicates a choice of 'auto' or 'none' or 'aggressive'. BLUE text indicates a sub-clause. GREEN text indicates a sub-sub-clause. Given a component type, such as Table, Drawing, etc., and the name of the component, add or drop a property. Add the named property with the given value. Modify a table using the specified action. When altering the table, add a field of the specified type. 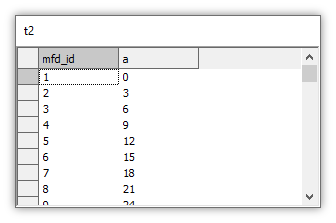 When altering the table, add a field of the specified type and fill the field with the value of the expression that is computed within the specified context. See the Computed Fields and Constraints topic for examples. When altering the table, add the specified constraint that is computed within the specified context. When altering the table, add the specified index. See the discussion for the CREATE TABLE statement below, for various options. When altering the table, add the named property with the given value. When altering the table, delete the named field from the schema. When altering the table, delete the named constraint from the schema. When altering the table, delete the named index from the schema. When altering the table, delete the named property from the table. When altering the table, rename the specified field. When altering the table, rename the specified constraint. When altering the table, rename the specified index. Launch a function that returns a table. Functions that return a table are called query functions. Returns a table of coordinate systems maintained in Manifold's internal database. Create a component of the given type. Some components, such as drawings or images, should be created with properties using the PROPERTY sub-clause. The CREATE query statement puts the final inserted name of the created component into createdname and creatednamequoted pragma values. The createdname value contains the plain name and the creatednamequoted value contains the name in bracketed '[...]' form for use in properties. When creating a component, create it with the named property and given value. For example, drawings are created with properties that cite the table they use and the field for their geometry. Creates a new data source in the temporary database which links back to the original database of the query. This allows bringing in data for analysis. Attempting to create such a link on the regular, non-temporary database fails. See the Temporary Databases topic. Creates a new temporary database with the specified name. The name must be unique and cannot contain multiple parts (it is a name and not a path). Create a table. We must create a table that contains some items, such as fields, using the various sub-clauses. When creating a table, create a field of given name and data type. 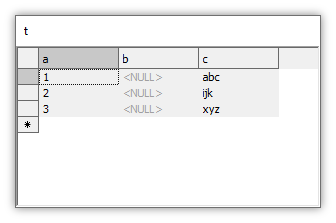 When creating a table, create a field of given name and data type as a computed field, using the expression that is computed within the specified context. Creates a table where if we open the table and enter 55 as a value for the Cost field of the first record the Retail field will automatically be populated with the value 110. Note that unlike the equivalent sub-clause for the ALTER TABLE statement, in this case we can only create a computed field and cannot add a field to be filled with a static value. When creating a table, create a constraint of given name and condition that is computed within the specified context. Creates a table with a constraint called Profitable such that a value specified for the Retail field in a record must be more than twice as large as the value in the Cost field. When creating a table, create a BTREE index on the specified fields optionally using options as cited below the BTREENULL entry. The above creates a table with a BTREE index on the Name field which compares values using the French as spoken in Belgium collation without considering accents on characters. When creating a table, create a BTREEDUP index on the specified fields optionally using options as cited below the BTREENULL entry. The above creates a table with a BTREEDUP index on the Name field which compares values without considering case. When creating a table, create a BTREEDUPNULL index on the specified fields optionally using options as cited below the BTREENULL entry. The above creates a table with a BTREEDUPNULL index on the Name and the State fields. Name values are compared without considering symbols while State values are compared without considering case. When creating a table, create a BTREENULL index on the specified fields optionally using options as cited below. When creating a table with an index for this field, build the index in ascending or descending order. When creating a table with an index for this field, build the index using the specified collation. See the COLLATE topic. When creating a table with an index for this field, build the index comparing values considering case or not. When creating a table with an index for this field, build the index comparing values considering accents on letters or not. When creating a table with an index for this field, build the index comparing values considering symbols or not. When creating a table with an index for this field, build the index comparing values considering or ignoring kana type for Asian languages. The default is KANATYPE (two instances of the same character in, say, hiragana and katakana, are considered to be different). When creating a table with an index for this field, build the index comparing values considering or ignoring character widths for Asian languages. The default is WIDTH (two instances of the same character which only vary in width are considered to be different). When creating a table with an index for this field, build the index comparing values ignoring or considering space between words. The default is NOWORDSORT (space between words matters). When creating a table, create an RTREE index on the specified field. Typically used to create a spatial index on a geom field in a table so a drawing can use that geom. When creating a table, create an RTREE index on the specified tile field, optionally applying the TILEREDUCE option in the <fieldTile> argument. AVERAGE - Default. Pixel values are averaged. When creating a table, create a property of given name and value. Delete records from a table. Deletes all records in the table. Apply the WHERE condition to the DELETE FROM statement. Deletes only the record for which the Name is Durango. Delete the named component of specified component type. Deletes the specified temporary database. If the temporary database being deleted was current at the time of deletion, the query engine switches the current data source to the original database of the query. Attempting to delete the original database of the query fails. Execute an inline query, the text for which is included within double square [[ ]] brackets in the EXECUTE statement. Nesting of EXECUTE statements within [[ ... ]] inline queries is not allowed. If we have one or more EXECUTE statements each should be in its own query component. See the EXECUTE topic. Specify the data source on which to run an inline query, using the native query engine for that data source. ON applies only to the inline text of the query and does not apply to any parameters or clauses outside of the inline text of the query within [[ ]] brackets. See the EXECUTE topic for a discussion of ON clause nuances. Pass parameters to a named query and execute that query. ...displays a line from mfd_root where the value of the field mfd_id is 2. Pass parameters to an inline query and execute that query. When passing parameters to an inline query, specify the data source on which to run an inline query, using the native query engine for that data source. ON applies only to the inline text of the query and does not apply to any parameters or clauses outside of the inline text of the query within [[ ]] brackets. Define a function. See the Functions topic. Define a script function. See the Functions topic. Define a script function stored in an external file. See the Functions topic. Define a script function using an inline script. See the Functions topic. Entry point into the script. When script functions return table results, for example, in the case of custom splitters, the Manifold query engine has to know in advance the structure of the returned table, that is, the schema. To accomplish this, the query engine uses a secondary script function which must return an empty table with the structure that will be used by the function that returns the actual data. The name of that secondary script function is specified via the ENTRYSCHEMA keyword, by default set to <entry>Schema. Insert values into a table. Set pragma values. A pragma guides the operation of Manifold or can also be used for debugging. The PRAGMA statement sets pragma values, which can later be read using the PragmaValue(<pragma>) function, which returns the value of the specified pragma. See the PRAGMA topic. The CREATE query statement puts the final inserted name of the created component into 'createdname' and 'creatednamequoted' pragma values. The 'createdname' value contains the plain name. The CREATE query statement puts the final inserted name of the created component into 'createdname' and 'creatednamequoted' pragma values. The 'creatednamequoted' value contains the name in '[...]' form for use in properties. Controls GPGPU code generation. 'auto' is the default. Restrict GPGPU code to the specified GPGPU device, zero based counting. An empty index value removes any previously specified device restrictions. ... restricts GPGPU code to only the first GPU device in the system. ... removes previously specified restrictions. Selects floating-point precision for GPGPU code. The default is 64 bit operation. ... sets GPGPU operation to 32 bit floating point precision. Controls progress bar: Override default progress bar text by specifying text to use. Controls progress bar: Advances the position of the progress bar to the specified value as a percent of completion. Controls progress bar: Specifies the position of the progress bar after the next statement as a percent of completion. Push all pragma values to the stack. See the PRAGMA topic. Restores pragma values from the stack. Attempting to PRAGMA POP without a corresponding PRAGMA PUSH fails. See the PRAGMA topic. Change the name of the specified component type. Change the name of a table. The SCRIPT statement allows queries to include an inline script. Inline scripts provide a way to use script functions in a single self-contained query component. Creates a results table by selecting data from tables or queries. The SPLIT clause works within a SELECT statement to create rows that are permutations between the results of the SPLIT query and the results of the main SELECT query without the SPLIT. See the SPLIT topic. A qualifier that filters SELECT results to omit records that contain duplicate data in the selected fields, leaving only one of each instance. If the Expenses table has records where the same type of job, such as Plumbing or Masonry is repeated, the above will result in only one record for each different type of job. COLLECT is an aggregate that returns a table. A qualifier that filters COLLECT results to omit records that contain duplicate data in the collected fields, leaving only one of each instance. The WHERE clause filters records returned by the COLLECT aggregate based on how the <condition> expression evaluates for each record. If the condition in the WHERE clause returns True, the record is included in the collected set. if it returns False or NULL the record is excluded from the collected set. Specifies ordering of the collected set. See the ORDER BY topic and the COLLECT topic. For n = <value> filter the result to provide records in the collected set starting with the n+1 record. For n = <value> filter the result to provide only the first n records in the collected set. See the FETCH topic. Create rows that are permutations between the results of the SPLIT query and the results of the main SELECT query without the SPLIT. Create a new table and insert into it the results from the SELECT. JOIN statements combine two tables into a results table based on a given condition. A JOIN follows the FROM in a SELECT statement. A cross join, also, called a comma join, or a cross join, uses a WHERE clause for the join condition. All other joins use an ON clause to specify the join condition. If we like, we can optionally also use the OUTER keyword in the above outer joins. The following three forms are exactly equivalent to the above three forms. Optional use of the OUTER keyword may make it easier to convert SQL from other database systems. See the JOIN Statements topic. A cross join returns all possible combinations of rows for the FROM table and is normally used with a WHERE clause to reduce the number of rows to only those records for which the WHERE <condition> is true. The longer form of a cross join explicitly uses the CROSS JOIN keywords. An optional short form uses a comma , character instead of the key words and is often called a comma join, where the cross join is implicit. When the WHERE condition is the same as the ON condition for the equivalent inner join, a cross join produces the same results table as the inner join. If the WHERE clause is not used in a cross join, the results table for a comma join returns all possible combinations of rows for the FROM tables. Important: the order in which the tables are specified chooses from which table common fields are returned. See the JOIN Statements topic. The WHERE clause filters records returned by the SELECT query based on how the <condition> expression evaluates for each record. If the condition in the WHERE clause returns True, the record is included in the results table. if it returns False or NULL the record is excluded from the results table. In the above the SELECT returns all employees. For each record WHERE clause evaluates the condition [Name] = 'Jane'. Only those records for which the condition is True go into the results table. GROUP BY works together with an aggregate function within SELECT. GROUP BY creates subsets of records to feed into the aggregate function. See the GROUP BY topic. A qualifier that works for GROUP BY similar to how the WHERE qualifier works for SELECT. See the GROUP BY topic. Controls parallel processing. See the BATCH and THREADS topic. Operators that can come after a SELECT query and form Boolean combinations between the results of the SELECT query and the results of their own query. Tables returned by UNION, EXCEPT and INTERSECT by default will have duplicate records eliminated. Use ALL to retain duplicates in the results table. <SELECT query> UNION <query> - Return a table of all records found either in the <SELECT query> results or in the <query> results. Returns all names found either in the Invoices table or in the Students table. <SELECT query> EXCEPT <query> - Return a table of all records in the <SELECT query> results but not in the <query> results. Returns all names found in the Invoices table except those who are students. <SELECT query> INTERSECT <query> - Return a table of all records found both in the <SELECT query> results and also in the <query> results. Returns all names found in the Invoices table who also are students. INTERSECT has priority over UNION or EXCEPT. See the UNION / EXCEPT / INTERSECT topic. When added to UNION, EXCEPT or INTERSECT, prevents duplicate records from being removed from the results table. Specifies ordering of the results table. See the ORDER BY topic. ... will return a results table beginning with the fifth record. Tables are unordered so this query makes sense when tables are ordered with ORDER BY. For n = <value> filter the result to provide only the first n records. The results table will provide invoice records with the three largest payments. Tables are unordered so this query makes sense when tables are ordered with ORDER BY. See the FETCH topic. TABLE takes a a table or a query expression and returns a table. TABLE CALL executes a query function that is, a CALL to a function that returns a table. Edit an existing table by placing values into fields. The WHERE clause filters which records are edited by the UPDATE statement based on how the <condition> expression evaluates for each record. If the condition in the WHERE clause returns True, the record is edited. if it returns False or NULL the record is excluded from UPDATE editing. Switches current data source. Goes to a child data source. The path can contain multiple parts. Switches current data source. Goes to a parent data source. Attempting to go to a parent of the starting data source fails. Switches current data source. Goes to the starting data source. The VALUE statement declares global values. It exists in two forms: the full form used to declare global values and a short form that omits the expression. In the above, a type is required. The type can be TABLE. A global variable can be redefined and assigned a different type and value. When this happens, previous references to the global variable will continue to use its former type and value, similar to what happens when overriding functions. The short form of VALUE takes an existing value and converts it to the specified type. If there is no value with the specified name defined, the short form defines it and sets it to a NULL value. The short form is useful for handling query parameters. Returns a table populated with the specified values, using as field names for the table result, result 2, ... Convenient for specifying literals when building tables and also as a general purpose means of executing expressions in the Command Window and within larger queries. Alias the names of columns to use the specified field names instead of the default result, result 2, ... names. Operators that can come after a VALUES query and form Boolean combinations between the results of the VALUES query and the results of their own query. Tables returned by UNION, EXCEPT and INTERSECT by default will have duplicate records eliminated. Use ALL to retain duplicates in the results table. These operate exactly the same as when used with a SELECT query. Edit - Schema works with SELECT results too - Launching Edit - Schema works with the results table returned by SELECT, same as with a regular table. This allows us to see the schema of the results table.